It's another challenge over at Your Next Stamp and it's perfect to showcase your Halloween creation. For my card, I fast forwarded the season to Winter to create this cute scene using Ice Skating Phoebe. To create the background, I used the Snowfall Panel die and airbrushed the sky with my Copics. I used the Winter Scene die for the background scenery and hand cut the snow hills for the two layers below that. The patterned paper was used for the ice to skate on. Phoebe and the trees were colored with Copics and cut out using the coordinating die set. For the trees and earmuffs, I used some flock for a little added texture. The images were popped up and the card was finished with some rhinestones for sparkle and the sentiment across the top. Stop by the YNS Blog to see the other creations some of the DT members have created. Thanks for stopping by and taking a peek. Have a great weekend! I know, I know! 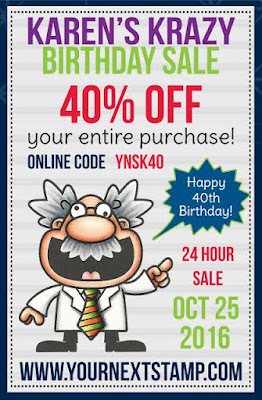 This is a fantastic sale, but before I go into all the details, let's start with wishing Karen a Happy Birthday and showing her a little love with this special blog hop the DT have put together! My card to share for her special day is made with the circles panel die, YNS 6th birthday set, and some fun sparkly gumdrops. Happy birthday Karen! I hope your day is filled with much happiness and surprises!! 3. 24 hour sale valid October 25, 2016 only - the sale ends at midnight EST . 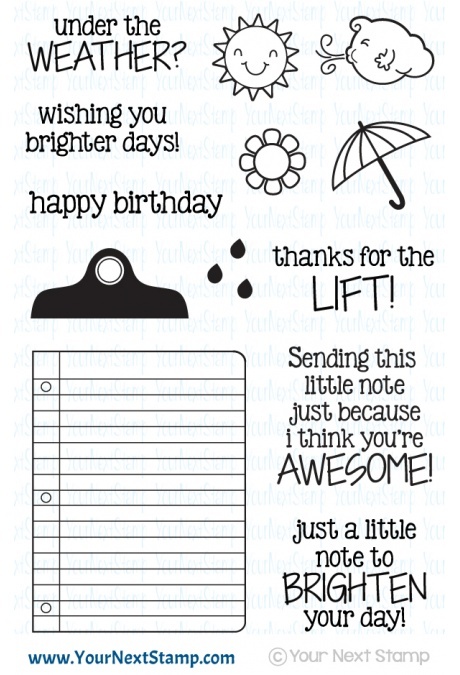 Don't forget to hop along and see what the other's have made to wish Karen a happy birthday! I hope you all having a great start to the weekend and have some warm weather to enjoy. Unfortunately, our warm weather here has packed up and sent in the cold to replace him. It was nice for a while to have some flip flop weather in the middle of Fall. Today is Feature Day over on the YNS Blog and the DT have shared some awesome projects using the theme of Favorite Technique. For me, my favorite technique is creating a scene using stamps and dies. This card was made using the Blast Off set to create the scene of space as he is taking off. I used the newly release Snowfall Panel die over some black card stock which I layered over a white base to give it the look of stars. Once the image was colored with Copics and cut out using the coordinating dies, the rocket was popped up over the black panel. 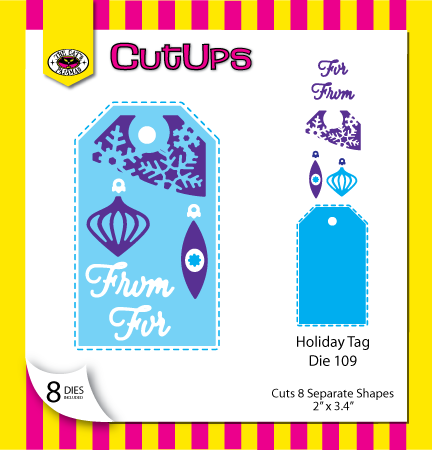 The stars were cut out with the same die set and placed in various spots. To add some more sparkle, some Silver Tinsel Gumdrops and small rhinestones were used throughout.The sentiment is stamped and popped up across the center. 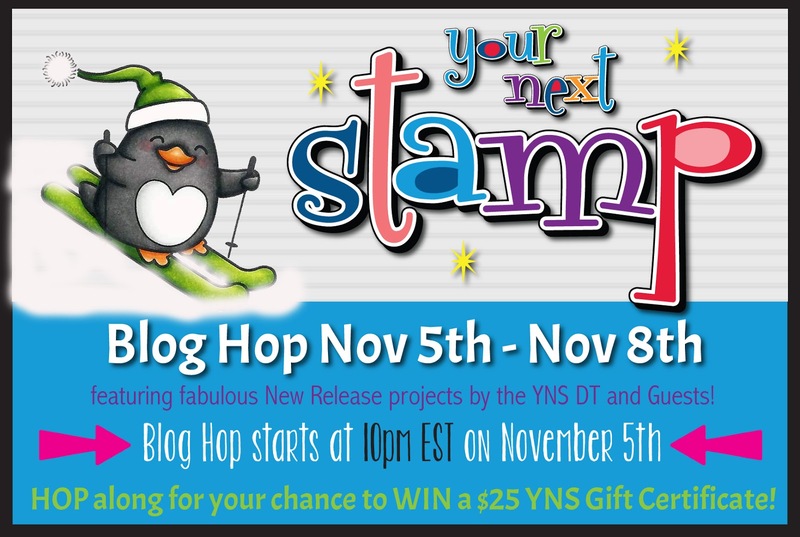 Be sure to stop by the YNS blog to see all the wonderful creations and leave a little love for your chance to win a stamp set of your choice! Thanks for stopping by and taking a peek here. Have a great weekend! 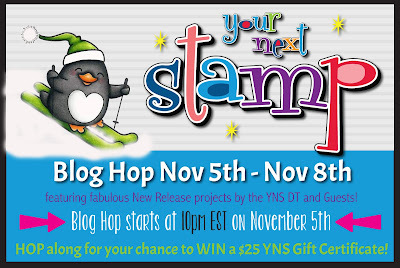 Each day this week, Your Next Stamp is sharing with you all projects the DT have come up for Halloween. Today I would like to share with you a few things to give some good treats to your favorite person. For the drink, I used the set Tricky Tonic to decorate the front. The image was stamped and colored in with Copics before using the coordinating dies to cut it out. This was popped up over the cut out from the Doily Trio One set and the dripping goo was placed at the top. This was completed with a spider on the end of his "web" glittered, as was the eyes and nose on the skull. 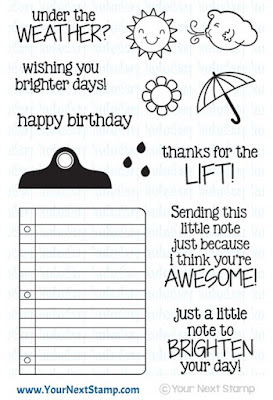 A black and white paper straw finished this look with the sentiment at the bottom. For the treat bag, I used the die set called Cute Shopping Bag to be able to place in a small bag of treats. The outside was decorated with the scallop circle and tag with the sentiment in the center. A cute candy corn image from the Fab-boo-lous set was used to complete the look. I hope I was able to help in a few Halloween treat ideas! Thanks so much for stopping in! Have a great Tuesday! The day has arrived! It's not only release day of TCP's October release, but it is also the start of the month long customer Winter Blog Hop! You can find all the details here. If you came from Lynn's blog then you are right on track. If you did not, you will want to start at the beginning so that you may join in in all the fun and have a chance at winning a $10 gift certificate to the TCP store! I am sharing with you a tag I made using the new Holiday Tag die set. 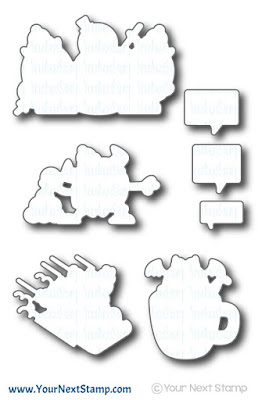 This is such a beautiful set and I love how you have some options for the tag. 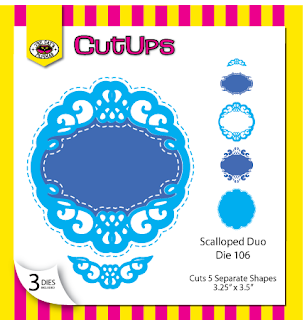 It is a 2 in 1 with being able to use the corner cut outs for a completely different look. I started with a creme cardstock base and used some patterned paper on the bottom, tied in with some ribbon. I used the corner cut outs for that lace look and added some Platinum Stickles to it. The word 'Joy' was cut out and glued on top of the tag. It was completed by adding some sequins and ribbon at the top. 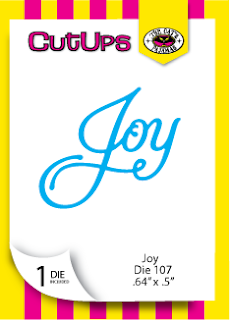 This 'Joy' die is your FREE with a $65 or more purchase! Woot! Be sure to head over to the TCP's blog as your final stop! Thanks so much for stopping by and we can't wait to see what you create to join in on the hop! It's sneaky peek day 5 over at The Cat's Pajamas. 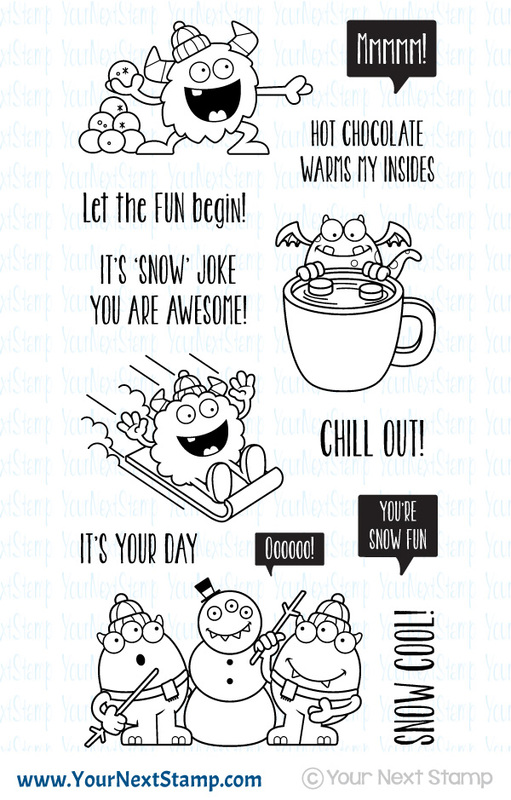 Today's sneak is so much fun and full of cuteness! It is called This Could Be Vodka. I've seen many mugs with this sentiment and get a good chuckle every time. 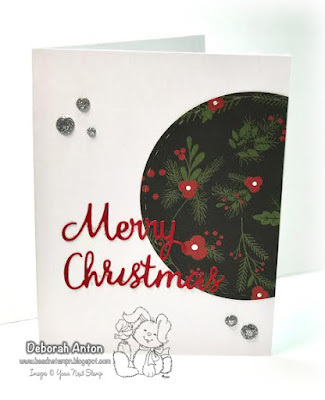 For this card, I used the soon to be released Cut Up Scalloped Duo for the center cut out through the patterned paper. It was placed over a white piece of cardstock which the image was stamped onto and the cup was paper pieced. I added a fishtailed banner to the top with the sentiment stamped directly onto it and finished the card with a few buttons. - Are you IN IT TO WIN IT? for a chance to win a $10 gift certificate to The Cat's Pajamas store, leave a comment on each of the sneak peek posts, including The Cat's Pajamas blog. A winner will be randomly drawn and will be announced on the TCP Facebook Page the following day. 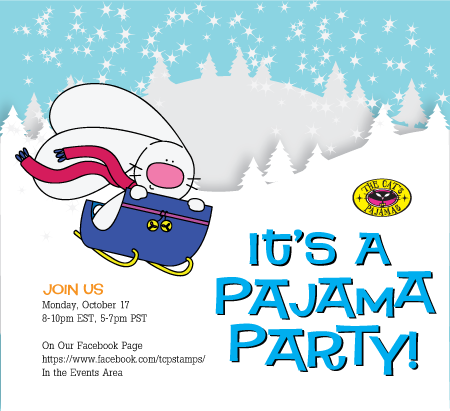 - Don't forget to join in on the fun!The Pajama Party on Monday, October 17 from 8-10pm EDT. 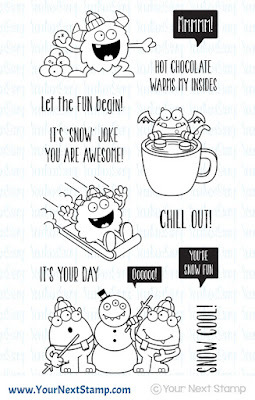 It's another Friday challenge with Your Next Stamp and this sketch is a fun one! I couldn't resist using the adorable Waddles Trick or Treat set for this sketch and I think it turned out cute! Waddles is just too adorable to not have in your collection and there are many different scenarios you will find him in over in the YNS Store. For this card, I stamped the sentiments on two of the squares while using two different images in the set for the remainder two square. They were colored in with Copics and the background papers were cute using the YNS Stitched Square die set. 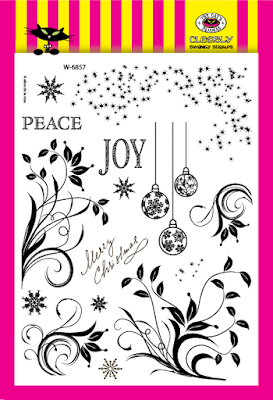 The patterned papers are from Doodlebug & Co. 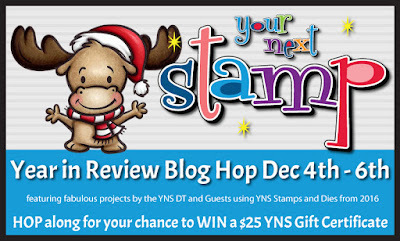 If you play along, and we hope you do, don't forget to upload your creation to the YNS Blog. 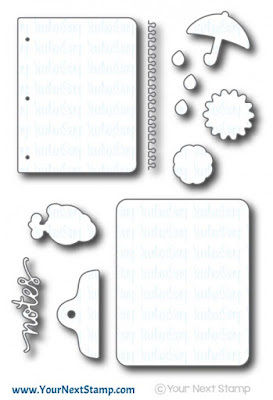 Also, while perusing the YNS Store to see all the newest additions, check out the new stamp pads! Fabulous colors with awesome coverage. Thanks for stopping in! 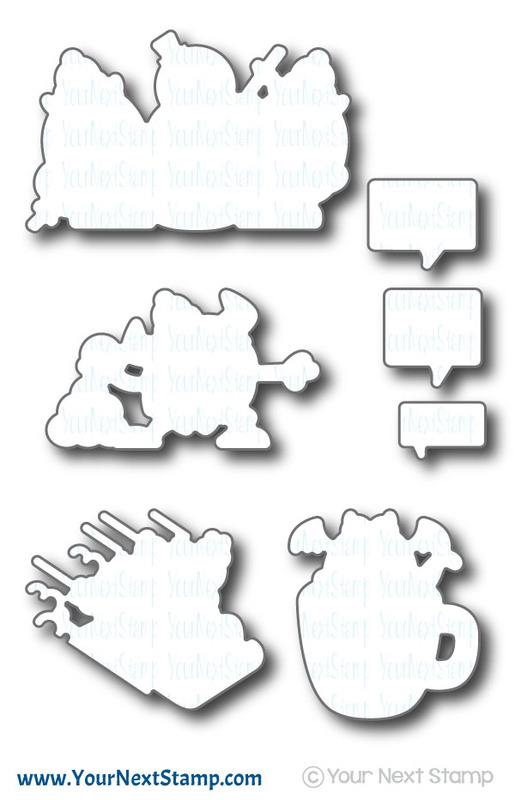 I love the beauty of this set with the many options it offers. I decided to showcase this one with the ornaments from the branch for a CAS look. I gave the branch an ombre type of look using 3 different Momento colors and then embossing it in clear. 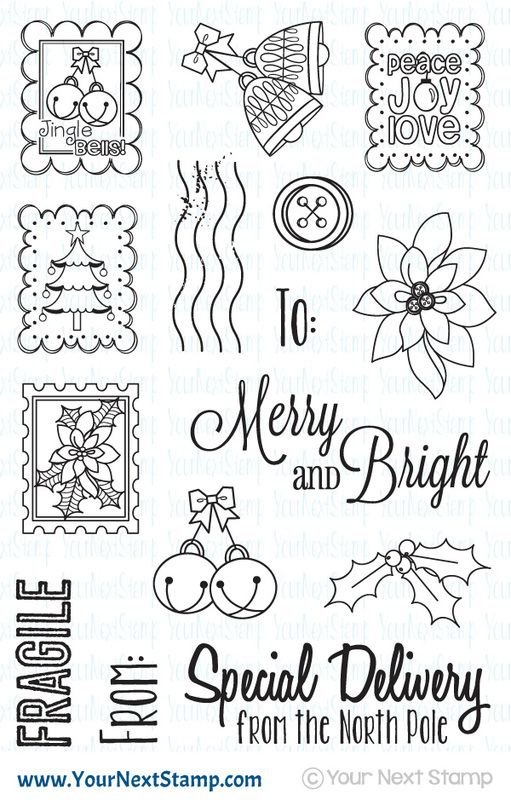 Using the smaller stars in the set, I embossed in a gold glitter that before coloring in the ornaments with Copics. I added a little white gel pen to that for a little pop of color. 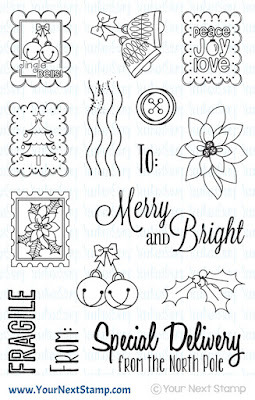 The sentiment was also stamped and embossed in clear to match the dimension of the leaves. I completed the card with some mini rhinestones for spahkle! - Are you IN IT TO WIN IT? Are you IN IT TO WIN IT? For a chance to win a $10 gift certificate to The Cat's Pajamas store, leave a comment on each of the sneak peek posts, including The Cat's Pajamas blog. A winner will be randomly drawn and will be announced on the TCP Facebook Page the following day.